Veterans for Peace and the Binghamton Community Friends Meeting (Quaker) presented $350 Stu Naismith Peacemaker awards to four graduating high school seniors, two at Chenango Valley and two at Chenango Forks High Schools. Kelly Smith, Kelly Thompson, Alexander McRoberts and Kate Flynn received the awards, given annually in memory of Stu Naismith (1927-2011), who served in the Navy in World War II, taught in both school districts, and was a founder of the local chapter of Veterans for Peace. The students earned the awards by working for peace in everyday life, preparing for further education, and writing an essay on peacemaking. Mr. Graves recounted this story in his introduction to this season’s first presentation, “Searching for Peace”, a collection of one-act plays and songs with peace as the central theme. He went on to say, and I paraphrase, “after thinking about all the current wars that are putting American lives at risk, maybe it is time to revisit the theme of peace.” I am glad he made that decision. Too often the courage to trumpet peace is drowned out by the false majesty of war. The present production was very similar to the 2006 production, but had musical interludes and a couple of additional theatrical acts. The November 7th, 2015 performance was, depending on the piece, poignant, audacious and/or inspirational. I also had the pleasure of seeing the production in 2006. This production was a reprise of the four original acts – “How Violence Is Ended”, “The Christmas Truce”, “When the Twins Went to War” and “The War Prayer”. The staging was different, but the text was the same. In the Buddhist legend, “How Violence Is Ended”, the clarion call was repeated, “Do not be short-sighted” (seek impulsive revenge) and “Do not be long-sighted” (hold grudges). “The Christmas Truce” recounts the spontaneous cessation of war on Christmas Eve by German and English troops during W.W.I. Hearing “Silent Night”, hauntingly sung, in German, offstage while the English trench soldiers become visibly mesmerized by its serenity was very powerful. The message of Mark Twain’s “The War Prayer” could not resonate more. In that act, a preacher in the pulpit is rallying the congregation to war through biblical passages and patriotic slogans when he is interrupted by a female messenger from God. She proceeds to translate the preacher’s uplifting rhetoric to its barbaric reality. After a prolonged silence of rapt understanding, the congregants declare her insane, and the preacher continues his sermon as the play ends. During the interludes, talented musicians within the cast amplified the powerful content from the dramatic acts. A faculty member sang, in French, a WWI protest song (while a translation was shown simultaneously) that included the words, “President, if blood be shed, let it be yours.” John Lennon’s “Imagine” and “Let It Be” were sung to echo the non-violent sentiment of the production. The evening ended with the entire cast and audience singing Lennon’s “Give Peace a Chance”. We all do have to participate in giving peace a chance. This production surely helped us see and hear how. Kristen Igo of Chenango Valley High School and Melissa Boekker of Chenango Forks High School won the fourth annual Stu Naismith Memorial Peacemaker Awards. The two $350 scholarships were given on June 8 and 12, jointly by the Stu Naismith Chapter of Veterans for Peace and the Binghamton Community Friends Meeting (Quaker), in memory of Stuart Naismith (1927-2011), a World War II veteran and tireless campaigner for peace, who taught in both school districts. Kristen and Melissa earned the awards by working for peace in everyday life, preparing for further education, and writing essays on peacemaking. The picture shows Stu's wife Peggy Naismith, Joyce Thomas of the Quaker Meeting, Melissa Boekker, and John Patterson of Veterans for Peace. 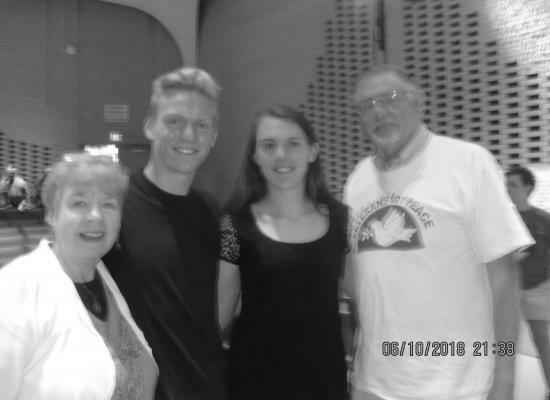 To support the scholarships in future years, contributions can be sent to the Binghamton Community Friends Meeting with the notation Peacemaker Award, in care of Alexa Héder, 9 Hickory Road, Binghamton 13905-1347. A peace vigil assembles in downtown Binghamton every Monday evening from 4:30pm to 5:30pm. This picture was taken at about 5pm on my way to the State Office Building for the Moral Monday protest. The peace vigil protests war and the use of drone warfare, among other things. Unless the weather prohibits it, this group of folks are there every week. As I stopped to speak with them briefly, someone else on a bike had stopped to read their signs and engage in conversation. People do notice these signs, from where small ripples occur and more people become aware of the effects of warfare in this world. From the bridge newsletter: Federal Courthouse Peace vigil back to our original site in front of the Federal building on Henry St. at 4:30 PM on Mondays. Every Monday, 4:30 to 5:30PM EST (change because of daylight savings time) for questions, contact Ann Clune at 607*773*0246.